Since 1978, Database Systems Corp. (DSC) has been providing computer related products and services including contact center phone systems and outsourcing services. DSC provides computer telephony products for contact centers including software that connects existing applications to our call center phone systems. Our call center phone systems are fully capable of performing automated messaging services and dialing. The following is a common definition for the term Automated Messaging. Automated phone messaging is a mass communications technique that delivers pre-recorded phone messages to hundreds or thousands of households and cell phone users at once. Automated messaging has both commercial and community applications. Messages can be sent to customers in bulk fashion or can be delivered to community members in the event of an emergency. Our phone systems can send phone messages to both individuals and answering machines. If our auto dialer detects a no answer condition or busy signal, the message can be scheduled for delivery at a later time. Complete online reports are available to view the effective delivery of messages in this fashion. Automatic Messaging Service - Register Online and Save! Contact DSC to learn more about our automated messaging phone systems and services. KB Home utilizes our automated messaging services to contact individual home buyers who have explicitly expressed an interest in being notified when a new KB home development is opened. KB Home records custom messages and downloads lists of prospective buyers using our outsourcing center. Our call center then contacts these prospective buyers using our auto dialer and provides them with a recorded message indicating where a new development has opened and giving them instructions on how to contact their sales organization. 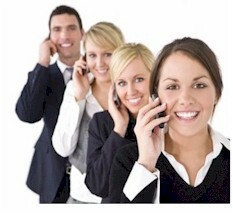 DSC offers automated messaging phone systems for virtually all types and sizes of organizations. Our phone message delivery system includes a modern Windows PC with telephony technology from Intel / Dialogic. When combined with our internally developed IVR software, these phone systems can perform both inbound call distribution as well as outbound phone messaging service campaigns. The WIZARD voice broadcasting system is our entry level call center phone system that supports up to 48 analog phone lines. If your automatic message center requires faster delivery to a larger audience, our PACER messaging system can be used to deliver messages using hundreds of digital phone lines. Contact DSC for a FREE analysis and quote and to learn more about our automated messaging products and reminder services.